Custom Designed Handcrafted Redwood Garden Bridges For Koi Ponds, Japanese Gardens, Landscape Bridges. Available in a wide range of designs and All sizes. Our Redwood Garden Bridge sizes are quoted as actual-size. Actual end-to-end lengths of each bridge will span the gap. For example a 8 foot bridge actually covers a 6 foot opening. With a foot of footing at each end. 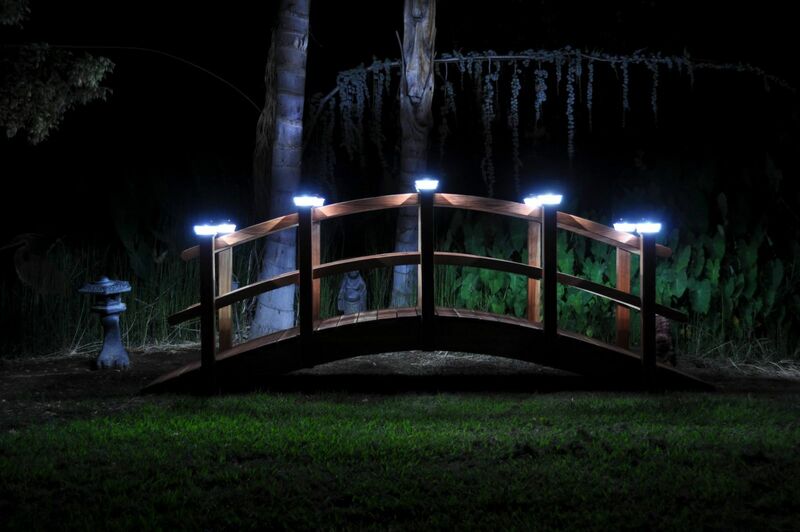 We are pleased to introduce our own custom designed bridges ,hand made with hand selected California redwood. Will custom build to your needs just for you to fit your pond, creek, stream, river, any size from 4 foot to 40 feet. We offer several different styles to choose from please look at them and decide which would look best in your yard , ones with ropes, rails one or two, curved rails, spindles, short post or no posts at all.